In this article we will discuss the best procedures to brush on a finish. No matter which finish you're using, the procedure for brushing is the same. The only difference is you have less time with faster drying finishes, such as shellac and waterbased finish. For many people, the first experience brushing comes with oil or latex paint, or with alkyd or polyurethane varnish. Each of these coatings is relatively easy to brush. Paint is easy because it doesn't have to go on perfectly; brush marks and other minor flaws are expected and accepted. Varnishes are easy because they dry slowly. For many people, the first experience brushing comes with oil or latex paint, or with alkyd or polyurethane varnish. Each of these coatings is relatively easy to brush. Paint is easy because it doesn't have to go on perfectly; brush marks and other minor flaws are expected and accepted. Varnishes are easy because they dry slowly, so there's plenty of time to spread them out evenly and get the brush strokes lined up with the grain. Polyurethane varnish is the finish most widely brushed by amateur woodworkers, and it is the finish that is almost always used in instructions on how to brush. There are countless articles, several videos and even segments of television ads that describe or demonstrate how to brush varnish. For some reason, almost all of these instructions suggest or show brushing slowly, several at the incredibly slow speed of eight seconds per foot. Try it; (I'll bet you can't brush this slow the first time). Though it's somewhat counter intuitive, many instructions suggest brushing across the grain, or diagonal to it, before lining up the brush strokes with the grain. Other instructions caution against shaking the finish, or even stirring it, because this will introduce air bubbles. Brushing is very simple, actually intuitively simple. The most critical rule for achieving good results, and the rule you almost never see, is to watch what you're doing in a reflected light. This rule holds for spraying just as it does for brushing. You can see what's happening in a reflection, and you can't see if there isn't one. As long as you see a problem as it occurs (usually a run, sag, drip or bubbles), it is usually easy to fix simply by brushing back over the surface. Above: Reflected light. When there's no light reflected in the surface (top), you can't see problems as they develop. Move your head to pick up a reflection from some light source so you can see what's happening for example, the runs and sags in this finish (bottom). Once you see a problem, it's usually easy to fix, most often by brushing back over the surface. Bristles or other trash that may have fallen into the finish are also easy to spot in a reflected light, and they're easy to remove with the tip of the brush or a small tool such as a toothpick. The damage done to the finish can then be repaired by brushing back over. No matter which finish you're using, the procedure for brushing is the same. The only difference is you have less time with faster drying finishes, such as shellac and waterbased finish. Be especially careful of runs and sags on vertical surfaces. Watch the surface in a reflected light as you brush, and brush the finish back out flat if it begins to sag. If you've applied too much finish to get it to hold to the surface, use your brush to transfer some of the finish to another part or remove the excess finish by dragging the brush bristles over the lip of a can or jar. Above: Depositing finish. Unless you have a reason to remove some of the finish from your brush, there's no point in dragging it over the lip of the container or tapping it against the sides. The most efficient method of transferring finish to a large surface is simply to deposit a brush load onto the work. It doesn't make any difference in which direction you brush with the grain or across it. Brushing across the grain doesn't help the finish get into the pores; it soaks in quite well by capillary action. Whichever direction you brush to begin with, however, be sure to brush back over and line up the brush strokes with the grain if possible. It will help disguise the brush marks and knock off most of the bubbles, if there are any. Lining up brush strokes may not be possible on turnings and other irregular surfaces. But light doesn't reflect evenly off these surfaces, so brush marks don't stand out anyway. 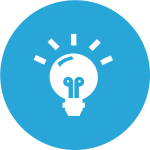 Flat horizontal surfaces are the most critical because people will see flaws easily in reflected light. To brush a large, flat surface such as a tabletop, lift your loaded brush out of the finish container (the original can, or a glass, metal or plastic container into which you've poured some of the finish) and deposit the finish onto the center of the area you intend to brush. Then stretch the finish out side to side all the way to both ends. If there's not enough to reach both ends, add some finish from the container. 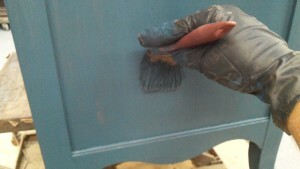 You'll quickly get the feel for how much finish, or how many brush loads, you need to deposit to make it to both ends. Above: Stretching finish. Once you have some finish transferred to the work, stretch it end to end. If you need more finish to reach the ends, add more. It's best to pour some finish into another container from the original, so if you should introduce some dirt you won't have contaminated your entire supply. Don't worry about creating bubbles. There's no way to avoid them because they're mostly caused by the turbulence created by the brush movement (the same as underwater bubbles created by the turbulence from a propeller), not by shaking or stirring. Bubbles in a wet finish film aren't a problem anyway as long as they pop out before the finish dries. Most will pop out as you line up the brush strokes end to end. With one section covered and the brush strokes lined up, deposit some more finish in the center of the next section and begin stretching out the finish end to end. Work this newly applied finish back into the previously applied finish before it begins to set up. Once a finish stiffens, brushing over it will drag it and leave severe brush marks. Here's where working fast is critical when using faster drying finishes. Working fast enough so previous strokes are still wet is called keeping a wet edge. Continue working across the surface, being careful not to drip on the finish you've just applied. To avoid doing this, hold or place the container of finish so you aren't swinging the brush over finished areas. You can work from the near side to the far, or the far to the near. It doesn't make any difference. It's almost always wise to sand between coats to remove dust nibs and other minor problems. Unless they are severe, use stearated #320-grit sandpaper. Above: Sand between coats. No matter which finish you're brushing, it's almost always best to sand between coats to remove dust nibs. In most cases #320 grit sandpaper works well. Cheap brushes are often blamed for brush marks, so most instructions encourage you to spend more and buy a better quality brush. More expensive brushes feel better to use, shed bristles less and usually hold more finish. But expensive brushes don't reduce brush marks. Neither do foam brushes, for that matter. There's no reason you can't substitute a cheap, disposable foam brush for an expensive bristle brush if brush marks are your only concern. I find bristle brushes much more enjoyable to use, however, and choosing one is pretty easy. It comes down to paying enough to get a brush that doesn't shed bristles (about $6 to $8 for a 2"-wide brush). Keep in mind that natural (China) bristles lose their spring in water, so you should choose a synthetic (nylon or polyester) brush if you are brushing a water-based finish. Either type of brush can be used with varnish and shellac. Clean water-based finish in the same manner as latex paint. Hold the brush under a faucet for a minute or two while spreading and massaging the bristles with your fingers. Then wash the bristles thoroughly with soap and water until you get suds. Dishwater detergent is usually handy and is perfectly adequate. Then rinse the brush in lacquer thinner or brush cleaner. You can use either of these for all the rinsing, but they are more expensive. Then wash in soap and water, usually two or three times until you get suds.